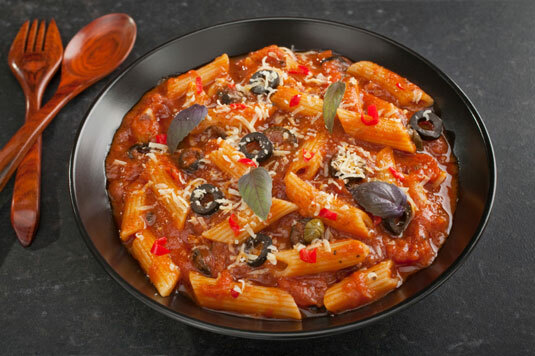 This dish comes from Rome, and the name comes from the Italian word puttana, or prostitute. Some sources believe that the name refers to the fact that the dish can be thrown together with pantry staples. Other sources mention the strong, salty flavor. In any case, this dish is extremely popular in Italy, especially as a late-night snack. In a large saucepan, heat the olive oil. Add the garlic and cook over medium heat until golden, about 1 minute. Add the red pepper flakes and anchovies, stir, and cook for another 2 minutes. Pour in the wine. Let it reduce slightly and then add the olives, capers, tomatoes, and water. Cook at a low boil for 25 to 30 minutes, stirring occasionally. During the last 2 minutes of cooking, add the parsley to the sauce. While the sauce cooks, bring 4 quarts water to a boil in a large pot. Add the kosher salt and penne, mix well, and cook until al dente. Drain the pasta and add it to the pan with the sauce. Season with salt and stir. Serve immediately.